After becoming a Nightingale, speak to Brynjolf. You learn that he and Karliah decided that you should be the one to replace Mercer once you deal with him. After you accept, he tells you to meet them at Irkngthand to stop Mercer Frey from stealing the Eyes of the Falmer and escaping with the Skeleton Key of Nocturnal. There are some bandits camped outside Irkngthand, but they're okay to kill or sneak past. The entrance is at the very top of the ruins. If you have a follower, they won't be able to accompany you. It's a winding path to get to the top; you may wish to come during the day so as to see it better. Once inside, it is recommended you sneak everywhere because there are irises on the walls which will drop out Dwarven sphere guardians (masters if you are at a high level) that you'll have to fight. Right into the first room, you'll notice an expert-locked chest next to the dead bandits. There is another chest with an adept-level lock at your left, near the crumbled columns. There is also a master-level chest next to the wall by the crumbled columns on your right. Two bear traps are set into the stone of the platform about halfway up the stairs so that the traps are completely hidden until sprung. Defeat the Dwarven sphere inside the room with a shallow pool and proceed through the open gate. The next room has three more Dwarven spheres. Before going down the stairs, turn right and follow the path in the upper floor to find a chest. There's another chest close to the wall, on the lower floor. Continue to the next room and you'll come across several spinning flamethrower traps. Just follow in the same direction they're spinning, and you can make it through without being hurt. You can also use your Become Ethereal shout to get across easily. A couple of Dwarven spiders will attack you on the way. Enter the corridor and you'll find an apprentice-locked chest straight ahead. At the end of the corridor, there is a Dwarven spider and another chest. There is also an apprentice-locked chest on the wall to your right just before the lift to Irkngthand Grand Cavern; it is next to a stone table with a built-in alchemy lab. There are a couple of potions, two Falmer ears and some scrap metal on the same table. When you are done, enter the lift area and activate the lever to descend to Irkngthand Grand Cavern. Karliah and Brynjolf will follow you now. Karliah believes Mercer knows that you're following and plans to ambush you down here. There is a trap on the left side of the door. After deactivating the trap wire, go through the door and continue down the hall. There is a chest behind an expert-locked gate, at your left. In the same room there are a couple of potions, some gems, scrap metal and various ingots. There are bear traps throughout this part of Irkngthand, especially in the corridors that connect the chambers, so watch where you step. In the large room, you will see a scene of Mercer sneak attacking a Falmer, but you're unable to get to him. To open the door in the next room, you have to activate the levers on either side of the room overlooking the camp - these levers activate gears to either side of the gate, so once you have pulled the first lever, you must reach and pull the second lever before the gears activated by the first lever stop turning. The Whirlwind Sprint shout can help here. The two levers can be pulled in either order to proceed. Be careful while crossing the chamber as there are spinning blade traps set in the floor that activate when you or your allies get close. There are two chests on the path to the east lever: one is next to a Falmer tent and the other one is next to the lever itself. The next chamber is in ruins and is full of falmer. Take the ramp along the south side of the chamber to find a chest behind a tent. At the west end of the chamber, near the collapsed tower, a set of stairs leading down is blocked by rubble. A chest with an adept-level lock can be found among the rubble. Take the ramp next to the rubble-filled steps; it goes north and then curves back toward the south wall to a door. Enter and you will reach a room with a dead Falmer inside. Behind an open gate you'll find some empty chests, scrolls of detect life (which will come in handy when fighting Mercer) and a mirrored message from Mercer. The message reads "One step ahead - Mercer" There is a bear trap in the first part of the corridor leading out of the room. In the next room, shoot the Dwarven centurion with an arrow while still standing on the steps - the Falmer will then fight and destroy him (it can also be activated via a button located on the side of the steps, if you drop down on the southwest side). Take the stairs on the east side of the chamber next to the skeever pen, and work your way up and around to the south end of the chamber. There are three bear traps in the walled corridor. There is a Frostbite Spider nest with a few living spiders and a single egg sac. Moving ahead, you'll find a door leading to Irkngthand Slave Pens, with a Falmer chest to its right, and a Dwemer chest to its left. The pens are used as a hive to the Falmer. There are 100 Chaurus egg sacs in the slave pens, the fourth highest concentration in Skyrim. Defeat the Dwarven spider and head up the stairs to the west to find a couple of ingots behind an apprentice-locked gate. As you come back out of the gate, turn right to harvest some glowing mushrooms along the south wall. In the southeast corner of the room, a chest is hidden behind some rubble. Down the stairs, you'll find a torture chamber with two Falmer and a dead thief inside. You can kill both Falmer by sneaking through the grid and activating the trap lever. The corridor heading north and east has three pressure plate traps. Karliah will tell you that you have a choice between sneaking or fighting the Falmer in the large chamber beyond. There is a chest located inside the third Falmer tent on the right. There is also a chest in the tent across from the third on the right. The next room has a simple pipe maze. Kill the Falmer and head up the ramp along the west wall to find another chest with an apprentice-level lock. Further down the room you'll face more Falmer and chaurus through the path that leads to Irkngthand Sanctuary. On the east wall, a nook covered with spiderwebs has an egg sac with a spider egg. Go down the ramp on the west wall, and there is an expert-level locked chest in the eastern-most tent. If you wish to bypass the enemies here, you may also sneak across the overhead pipes. Just before entering the corridor that leads to the Sanctuary, there's a locked master-level chest next to the Falmer door. 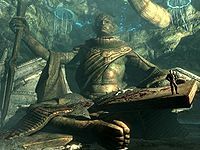 In the sanctuary, you'll see a short scene of Mercer prying out the eyes of the Falmer statue. Mercer will then collapse the ledge you're standing on, and after a short conversation, you will have to fight him. During the fight, he will use his Agent of Subterfuge power on Brynjolf, causing him to attack Karliah. This will keep Brynjolf and Karliah out of the fight. Mercer will turn invisible occasionally during the fight (position yourself on the stairs and let Mercer come to you; for whatever reasons, he doesn't sneak up behind you). Use the Detect Life scrolls (or the Detect Life spell if you have it) to see him; if you have the Aura Whisper shout, this can also be used to reveal his location. If you have the Slow Time shout, use this when he appears in front of you and he can be taken easily if you are leveled high enough. Once Mercer dies, a pipe at the top of the room will burst, flooding the room. Take the Skeleton Key and the Eyes from Mercer's body, and wait for the water to rise. Once it gets high enough, a hole will appear in the roof above the statue's head. Run out through the short passage to escape. This takes you to Bronze Water Cave; if you had a follower, this is where they will be waiting for you. You can give the left eye to Delvin for gold as part of The Litany of Larceny; the right eye can be kept or sold to a merchant. Talk to Karliah to complete the quest, and she will give you her Nightingale bow. In the room after you have to choose the "high road or low road", after descending the ramp with the bear traps you can find an open door on the right side. There are three empty chests of the two different dwemer chest types, a few scrolls to pick up, and a note scratched into the metal door. Written backwards, the message reads "one step ahead -Mercer". If asked to stop following you, Karliah and Brynjolf may not automatically start following you again. When you enter the sanctuary, they will appear. While the water is filling in Irkngthand, when you touch the water the game may freeze. Reloading a previous save from before entering that zone should resolve this. Before leaving the sanctuary, be sure to talk to Karliah or both she and Brynjolf may become stuck underwater. At this point you will not be able to talk to her, essentially breaking the quest. Use the console commands prid 58F1A and then moveto player. This way you can talk to her and continue the quest. Alternatively, you can try swimming and bumping into Karliah repeatedly to knock her into the correct path and out of the water, at which point she will continue normally. This may take a while, so it is a good idea to have a waterbreathing enchanted item with you to prevent drowning (if you are not playing as an Argonian). Another option is to shoot her with arrows when she is in sight from the land. She will run up at you. If you have a potion of paralysis, paralyze her when she is on land. Exit and come back. You may be unable to loot the Skeleton Key and one of the eyes from Mercer's body. To solve this, go out to one of the beds at the start of the dungeon, "sleep" in it, and the game will ask "Serve your time in jail?" Click yes and you'll appear outside of the prison you broke out of. Now you can return and loot the corpse. Where you enter the room with the statue where Mercer is, you may freeze and the game does nothing after Mercer says "Karliah, When will you ever learn you cannot get a drop on me?" Use the console command setstage TG08B 40 to fix this. You can also use command prid 00022651 and then moveto player to move Mercer to your position and fall down off the ledge, then he will automatically go back to his correct position on top of the statue. He will then continue to cast a spell making the ledge crumble and will speak to you. If you beat Mercer behind the statue's head, he might fall through the ground, making you unable to loot him, thus preventing the quest from advancing. Simply reload to fix this. ? Use the console command setstage TG08B 50 to fix this. Brynjolf or Karliah may leave their posts and walk to Riften as soon as you enter Irkngthand, rendering the quest non-completable. Their dialogue may say that they are still in Irkngthand. You can find them on the path to Riften from Irkngthand by following your quest marker. You will be able to then start the quest with Karliah, although a short run back to Irkngthand will be required. Make sure to keep Brynjolf and Karliah close during your advance back up to Irkngthand as not zoning into Irkngthand means that you are not guaranteed any followers. ? To fix this, simply go through the dungeon yourself, and they will appear in the Sanctuary once you get there. The game will freeze or lag in the middle of Irkngthand. One known fix is to restart the console and reload your last save. If you speak to Karliah again after escaping from the water and after the dialogue she initiates, the game will display dialogue options that should only become available at the end of the quest Darkness Returns. If you enter the Sanctuary while sneaking, Karliah and Brynjolf may not enter and Mercer will be unable to climb down the statue. In the Irkngthand Grand Cavern, Brynjolf will ask you to choose the between the high or low road. You may see a Falmer stuck inside of one of the tents. If you kill the Falmer in the tent and enter the tent to loot, you may become stuck as well. 10 I'm on my way to Irkngthand, a vast dwarven ruin that supposedly contains the legendary "Eyes of the Falmer." Karliah and Brynjolf are waiting for me within. Together we hope to stop Mercer Frey from stealing the Eyes and escaping from Skyrim with the Skeleton Key of Nocturnal. 20 I've entered Irkngthand, a vast dwarven ruin that supposedly contains the legendary "Eyes of the Falmer." Karliah and Brynjolf are waiting for me within. Together we hope to stop Mercer Frey from stealing the Eyes and escaping from Skyrim with the Skeleton Key of Nocturnal. 30 Karliah and Brynjolf have joined me in my exploration of Irkngthand, a vast dwarven ruin that supposedly contains the legendary "Eyes of the Falmer." Together we hope to stop Mercer Frey from stealing the Eyes and escaping from Skyrim with the Skeleton Key of Nocturnal. 40 I've finally located Mecer [sic] Frey within the ruins of Irkngthand. He seemed to be expecting us, and I'm afraid he led us here with the express purpose of eliminating the Nightingales once and for all. 45 Mercer Frey, betrayer of the Thieves Guild and Gallus's murderer is finally dead. Upon his death, a wave of magic issued from his body and has caused the already crumbling chamber to collapse and fill with water. 50 Mercer Frey is dead and I've recovered the Skeleton Key of Nocturnal from his corpse. I need to escape Irkngthand before the place collapses around me. 60 Safe from the dangers below, Karliah, Brynjolf and I finally have a moment to breathe. Mecer [sic] Frey is dead, the Skeleton Key of Nocturnal is in my possession and, most importantly, the Nightingales have survived. 200 Finishes quest Karliah, Brynjolf and I have slain Mercer Frey, escaped Irkngthand and recovered the Skeleton Key. All that remains is returning the artifact to the Twilight Sepulcher where it belongs; a journey I must undertake alone. The following empty quest stages were omitted from the table: 0, 1, 32, 33, 35, 37, 41, 47. On the PC, it is possible to use the console to advance through the quest by entering setstage TG08B stage, where stage is the number of the stage you wish to complete. It is not possible to un-complete (i.e. go back) quest stages, but it is possible to clear all stages of the quest using resetquest TG08B. This page was last modified on 16 March 2019, at 23:02.